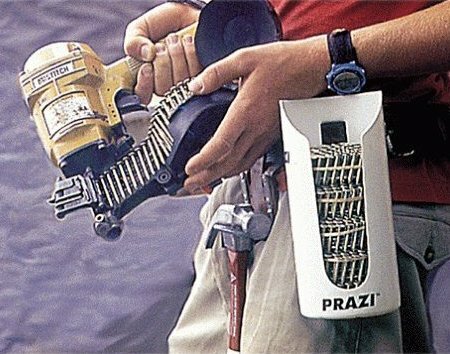 The rigid Coil Caddy holds wire-collated framing or roofing nails for many major-brand air nailers. Clip the Coil Caddy loaded with nail coils onto any 2″ heavy-duty work belt, and keep on working rather than walking back to the box to get more nails. You can find the Coil Caddy for around $10. Before the jump, I was thinking of just modifying a similar width of PVC. For $10, I will just avoid the aggravation. Do you make it for roofing coils also?